You could poke him with a pillow and kill him. 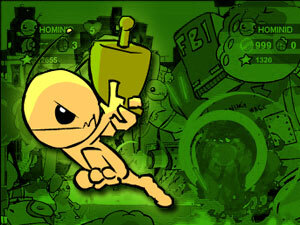 Alien Hominid is a 2-D Side-scrolling Action Game that originated on Newgrounds. The flash version seen on the site was programmed by Tom Fulp and designed by Dan Paladin. It was later made into a multi-platform game in 2004 through 0~3 Entertainment and is well known amongst gamers and the Newgrounds community. This game stars a little yellow alien who has crash-landed on Earth, and tries to escape the clutches of the FBI, Communist Russians and Area 51 agents to get home. Fat Kids help him along the way, but the story doesn't get much more complex than that. The gameplay is reminiscent of games like Metal Slug, with the player being a One-Hit-Point Wonder that runs through wave upon wave of enemies to reach the bosses at the end of each level. It also contains a few mini-games. Overall, the game has been very well received by critics. The original flash version is available here. Adjustable Censorship: There is a "Gore" option in the options menu. Disabling it will replace all blood with flowers, and finishing the first level with gore disabled unlocks a crown of flowers as a hat. A.I. Breaker: In the original flash game, crawling. Aliens are Bastards: Subverted, the title character is only slaughtering the FBI Agents because they're trying to kill him. Ambidextrous Sprite - The Hominid will hold its gun with its left or right hand depending on which way it faces. And Your Reward Is Clothes - A wide variety of hats, wigs and headwear is unlockable. Auto-Scrolling Level - Most of level 2-4 scrolls horizontally and a portion of level 2-5 scrolls vertically. Background Boss- The second-to-last boss sits in the background the entire time. Badass Adorable - The title character. Bloodier and Gorier - The GBA version, of all things, applies this trope to the final boss's death. In the other versions, there are two phases to the fight, and the second ends with him falling off a UFO and presumably dying a Disney Villain Death. In the GBA version however, only the first phase is retained, and it now ends with his head exploding and alien viscera spraying all over the place. Chain Reaction Destruction - Stronger enemies, minibosses and bosses. Charged Attack - Available from the get-go for the Hominid. Defeat Means Friendship - The FBI's Install Ball. Easy-Mode Mockery - You get 99 continues on thumbsucker mode, but you cannot go past either level 1-3 or 1-5, depending on the console version you have, until you choose a harder difficulty. Elite Mooks - A bunch of these exist, notably the jetpack-wearing ones and the flame/ice-thrower ones. In the third set of levels, the Area 51 agents are a little more tougher than the FBI and soviets before them. For one thing, they are not as fazed by seeing the Alien eating their comrades. Given where they work, who would be? Gory Discretion Shot - Boris the soviet leader dies like this- he gets carried away by a giant eagle he attracted earlier in an attempt to kill Alien Hominid. It drops him on a Conveyor Belt of Doom, which moves him towards a giant buzzsaw. Just right before he touches it, the scene shifts back to Alien Hominid. Hoist by His Own Petard - At the start of Level 2-5, Boris (the Soviet leader) scatters birdseed on the ground, which attracts giant eagles that kill you by grabbing and eating you if you touch them. Immediately after that is a Conveyor Belt of Doom with giant moving buzzsaws mincing anything on it (which you have to move under). After his defeat, Boris tries to get away from you via parachute, only to be grabbed by one of the eagles he attracted, which drops him on the conveyor belt. Stunned, he moves towards the buzzsaw... Cue Gory Discretion Shot. Idiosyncratic Difficulty Levels - The easiest difficulty level is called "thumbsucker". Knife Nut: The Hominid pulls one out and slices at an enemy whenever he's in melee range. Made of Plasticine: The FBI, Soviet Soldiers and Area 51 Guards. For goodness' sake, these humans take one regular shot to die, even less than a regular desert scorpion (which take three). Matryoshka Object: Partway through the fight with the robot bear, you have to fight against four robot bears based off Russian Dolls that split into smaller robot bears when defeated. Mirror Boss - The final boss is a super-buff version of the Alien Hominid with better attacks, a giant version of your spaceship and a lot more health than you. Nice Hat - There's plenty to choose from. Even on easy mode, with five continues and spawning each time with a shield and doing increased damage to enemies, you will still die over and over again. And the console version's difficulty is a step down from the original flash game. The Alien Hominid and various mooks. The Alien Hominid can survive certain attacks though, such as getting knocked down by a soldier. One-Hit Polykill - Possible with the charge shot or various weapon power-ups. Puzzle Boss - One of the bosses in the final stages is a "Simon Says" type boss. You have to shoot the colour in the correct order, each round adding an extra. Get the wrong colour? You get shocked and die, and have to repeat the whole process again. Scary Scorpions - The desert level has them. They can take more damage than a normal human being. Schmuck Bait: Occasionally, you'll see little flowers in the ground. Digging directly under them will give you an extra life. One of these is located in a level where digging underground will get you chomped by a monster. Go ahead, try getting the flower and see how that works out. Shout-Out - Level 1-3 has various street signs, with one of the signs having the word "Pico," in it, referencing another of Tom Fulp's works; the Pico series. Others are scattered throughout the game. The Dog Bites Back: As revenge for being bullied by the FBI, the Fat Kids decide to give Alien Hominid powerups. The Greys - The boss of 3-1. Unexpected Gameplay Change - Levels 1-5 and 2-6 are Shoot 'em Up levels. Video Game Cruelty Potential - There are plenty of ways to kill your foes, from plain-old shooting them to biting their heads off. Moreso though, there are plenty of ways to kill off your teammates in co-op mode, the best of which is in level 1-4. One player can get into the UFO, use the Tractor Beam to capture their teammate, then drop them into a woodchipper. Violation of Common Sense - You can die by staying underground too long. Doing this in a certain spot gives you a shark fin hat. The boss of level 1-4. WARNING: DO NOT DAMAGE HEAD. He was much harder in the flash game, though. In both the console releases and the original flash game, the first mid-boss easily qualifies. This boss has an extremely simplistic and obvious pattern with easy-to-dodge attacks. Whack-a-Monster: The electric sockets Mini-Boss.